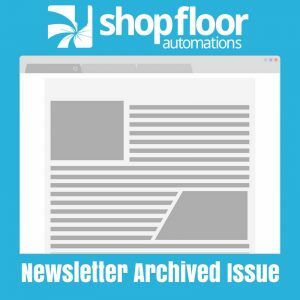 The following is an archived copy of the Shop Floor Automations Newsletter – October 2011. As the end of the year approaches, we would like to share our excitement for 2012. Shop Floor Automations has added new solutions to our product line to improve automation and productivity on your shop floor. Designed for manufacturers with multiple buildings and existing Ethernet infrastructure. The hardware eliminates PCI cards plugged into computers and directly links to the network backbone. You can network up to 256 machines to your Windows-based PC. The hardware supports transfers of your CNC programs, offsets and parameters. This solution supports a wide range of CNC protocols for drip-feeding, downloading, and uploading via RS232. Models are available in a 1, 2, 4, 8, or 16 port configuration and include a 5-year warranty from Shop Floor Automations. Do you have an outdated, unsupported DNC System from a software company who has been out of business or not updated their product since Window NT or 2000? Now is the time to consider a software upgrade with our trade-up program. For orders placed in 2011, we will provide up to 25% of credit towards the purchase of a new system from Shop Floor Automations. Call us now at (877) 611-5825 Toll Free! For all existing customers, please remember to backup your systems. Consider a spare hub, PC or even our backup portable USB device in case something goes wrong. Downtime is costly and a small investment now can save thousands later. Tell your colleagues about Shop Floor Automations and receive up to a 5% or 10% referral reward when they become a customer. Fill out our contact form with the company information and details or contact your Account Executive. Link to original newsletter HERE.